Kind words and compliments from fans around the world. Tell your inspirational story in text, pictures, videos, etc…and I’ll share it with the world here. I’ve been following your blog/youtube since my first day in boxing. 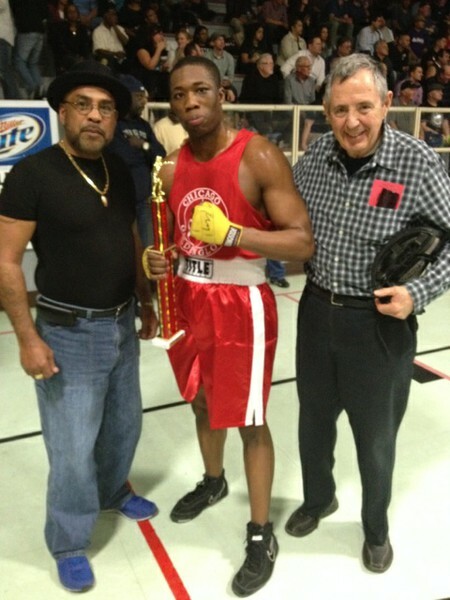 This past april I won the Sr. Novice Heavyweight Golden Gloves in Chicago. I just want to say your vids have been helpful and inspirational along the way. I’ve had to learn the techniques you talk about the hard way in the gym. But you’ve always been another great rescource for knowledge. I’ve attached a picture from the Golden Gloves. That’s me with just two of the several coaches who’ve influence me. FYI ive been watching your videos on you Tube for about six months. Im finding them a great help. I would just like to say your technique is brilliant and you ability to to articulate what happens is in various boxing scenario’s is great. Ive only been boxing for two years, im 42, ive gone from being a 96kg couch potatoe, to being a 78kg dedicated boxer. Here in Ireland a phenomenon of people getting into fitness has been sweeping the country. Boxing has become very popular due to the brilliant example of people like Katie Taylor. My trainer, too is a technical Ametuer boxer and expects nothing but perfection from both us and himself. But still ! what ive learned from your videos has given me an edge in a high performing class. Just want to say keep up the good work the world really needs people like you. Hey Johnny, how are you man? I just wanted to say a huge, huge thank you for making ExpertBoxing and posting so many helpful tips! I’m a seventeen year old that trained in boxing when I was younger, but had to quit, and I started back up a few months ago, I’m going as often as I can and as hard, I’ve completely changed the way I eat and I always read your articles and watch your videos and they help me so much! I’ve got the goal of starting amateur boxing at the start of next year and pursuing boxing as a career, as it’s the only thing I’ve ever done, that I’ve actually been good at. Sorry for the huge paragraph, I just wanted to say a huge thank you man, it means a lot what you do!! I really love your methodical teaching, breaking down movements to their basics, etc. I am a retired violinist turned boxer and have been a bit frustrated at the general “sink or swim” attitudes of boxing coaches. You either figure it out or you don’t based on general demonstrations and repetition. You bring a refreshing approach to teaching the sport that is prevalent in both music and dance but seems to be missing in boxing otherwise. Your articles and, especially the foot movement video, have helped me address aspects of the sport that I wasn’t able to figure out. Boxing has always been a dream of mine, not just to go through the motions but to participate at a reasonably high level. I am 47 and have survived 2 heart attacks so this path has not been easy. God willing, I will have my first fight at the end of August and, win, lose or draw, you will have been a big part of helping me get there. Thanks! This is the best stuff I’ve ever found on the internet for boxing training! The best videos and breakdowns anywhere! I’ve been a boxing/kickboxing and MMA coach for 20 years and I am always trying to improve my skills as a coach. This is exactly what I’ve been looking for. Thanks so much for your generosity sharing your time and expertise. I’m wondering if you know of any trainers here in NYC who might have a perspective similar to yours, AND be willing to work with a recreational/amateur client. My experience so far has been that the guys will demonstrate things, but not explain them much, let alone go into any detail about the mechanics of technique/form. I’m a pianist, so I really REALLY need to avoid any injury that could be prevented with good technique. Part of the reason I’m learning boxing (other than boxing just being awesome) is to experience being a student in a completely foreign medium. It makes me a better (piano) teacher. And I know from becoming a professional musician that even one lesson with a truly masterful teacher (not just a coach per se) can give you enough to work with and extrapolate from for a very long time. Forever, even. I’m actually going to be in Cali in September, if you have any interest in a session or two I would be super excited to work with you. You’re in LA, right? Been watching your channel for long time! Great coaching & information! I’ve trained Muay Thai on & off sense 93. I wish I had access to your coaching earlier! I’ve used techniques learned from you that should have been in my foundation, but no one explained or taught it. Keep up the great work! Always something to learn & keep motivated! I really enjoy your YouTube videos. I’m learning a lot from them. Your videos are the best out there. I’m probably going to get your power punching videos. I boxed when I was in high school and college. I’m middle aged now but want to get back into it for self defense and to stay in shape. I live in the Redwood City CA which is on the peninsula in the San Francisco Bay Area. Keep up the good work! just want to say to you that you are a true source of motivation for me and a lot of others boxers I think, and I want to thank you for all your work! thanks you again, and i wish you a lot of good things in your life, and in the ring. There are a ton of articles on the web on boxing training methods, techniques, exercise, etc… Quite often, a very important facet of the game is overlooked. I recently came across an article by Johnny N. “Expert Boxing” that really nailed it because it talks about one of the MOST important aspects of boxing. To become a champion, you have to think like a champion! All the greatest pugilists in history, whether professional or amateur, all have something in common. They have the mindset and an attitude of a winner! It’s easy to tell someone to think like a winner. It’s not as easy to show someone how to think like a winner. One of the best lines that I picked up from this article is, “Boxing is 100% mental, and 100% physical.” I highly recommend that you read and apply the strategies in this article. Indeed, these can be applied to winning at every aspect of life. Our goal at Jersey Boy Boxing is to develop leaders and role models, not just boxers. “5 Mental Strength Tips to Make you a Champion” by Johnny N.
– The Jersey Boy Boxing Team! Your article about 2 legged punching is just incredibly effective.